Problems started creeping in because of various restrictions imposed on the freedom of women. In the social fields, pre-puberty marriage came to be practiced, widow remarriage was prohibited, husband was given the status of God for a woman, education was totally denied to woman, custom of ‘Sati’ became increasingly prevalent, purdah system came into vogue and practice of polygamy came to be tolerated. Manu, the writer of Manusmriti and law giver of Indian society, said that “women have to be under the control of her father during childhood, under her husband during youth and under her son during old age. At no stage, shall she deserve freedom.” However he balanced this with the statement that a society in which the woman was not honoured would be condemned to eternal damnation. In the economic field, a woman was totally denied a share in her husband’s property by maintaining that a wife and a slave could not own property. In the religious field, she was forbidden to offer sacrifices and prayers, practise penance or undertake pilgrimages. Some reasons for this sorry state of affairs i.e. 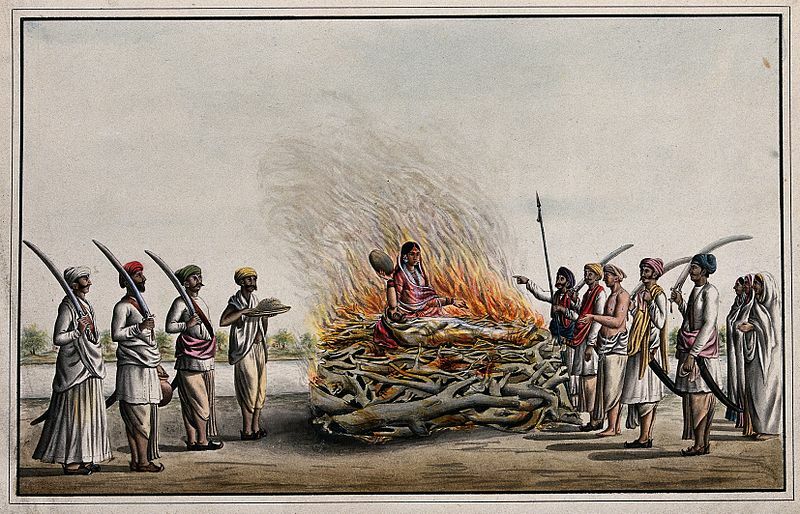 the low status of women in post-Vedic period were imposition of Brahmanical austerities on the entire society, rigid restrictions imposed by the caste system and the joint family system, lack of educational facilities for women, introduction of the non-Aryan wife into the Aryan household and foreign invasions and the like. During the Buddhist period, the situation improved a little though there was no tremendous change. Some of the rigidities and restrictions imposed by the caste system were relaxed. During the rule of benevolent kings such as Chandragupta Maurya, Ashoka, Harshvardhana and others, women regained a part of their lost freedom and status due to the relatively broadminded Buddhist philosophy. In the religious field, women came to occupy a distinctly superior place. Women were permitted to become “Sanyasins”. Their political and economic status, however, remained unchanged. The medieval period(500 AD – 1500 AD) proved to be highly disappointing for the Indian women as their status further deteriorated during this period. Muslim invasion of India completely changed the direction of Indian history. The influx of foreign invaders and the Brahmanical iron laws were main causes for such degradation. As far as a woman was concerned, her freedom was curtailed, knowledge of not only the scriptures but even letters was denied to her and her status was reduced to that of an appendage on man. Caste laws dominated the entire social life. Widow re-marriage and levirates were disallowed. Women could not inherit property and girls were treated more as burdens or liabilities. The status of women was reduced to that of slaves and they faced evils such as child marriage, purdah system, Sati practice etc. However, during the 14th and 15th centuries, the social situation underwent some change. Ramanuja organised the first Bhakti Movement during this period which introduced new trends in the social and religious life of women in India. The Bhakti poet-saints tried their best to fight the social evils of the day through their preachings and change the thought process of the people which was held captive by the decayed religious dogmas propounded by the priestly class. Poet-saints like Chaitanya, Nanak, Kabir and others fought for the rights of women to religious worship. The purdah system was abolished and women could go out of their families to attend pravachanas, kirtans, bhajans and so on. As a result, they secured certain social freedom. They were encouraged to read religious books and to educate themselves. The Bhakti Movement did not permit saints to take to sanyas without the consent of wife. But this movement did not bring any change in the economic structure of the society and hence women continued to hold low status in the society. The revival of ‘Sati,’ the prohibition of remarriage, the spread of “Purdah” and the greater prevalence of polygamy made her position very deplorable. Thus there was a huge gap between the status of woman in the early Vedic period and that in the medieval period and onwards. During the British Raj in India, Western education was introduced in India in the early 19th century and as Indians were exposed to western culture, an urgent need for social and religious reform began to manifest itself. The weakness and decay of Indian society was evident to educated Indians who began to work systematically for their removal.They were no longer willing to accept the traditions, beliefs and practices of Hindu society simply because they had been observed for centuries. Raja Rammohan Roy, the “Father of the Indian Renaissance”, worked throughout his life for the social, religious, intellectual and political regeneration of the Indians and fought relentlessly against social evils like sati, polygamy, child marriage, female infanticide and caste discrimination. He argued that ancient Hindu texts, the Vedas and the Upanishads upheld the doctrine of monotheism. Consequent to his efforts, Governor General Bentinck passed a law banning the Sati custom in 1829. Ishwar Chandra Vidyasagar was a staunch supporter of women’s education and opened a number of schools for girls in the districts under his charge. Despite opposition, he openly advocated widow remarriage and after a prolonged struggle, the Widow Remarriage Act was passed in 1856. He also spoke vehemently against child marriage and polygamy. Contd..